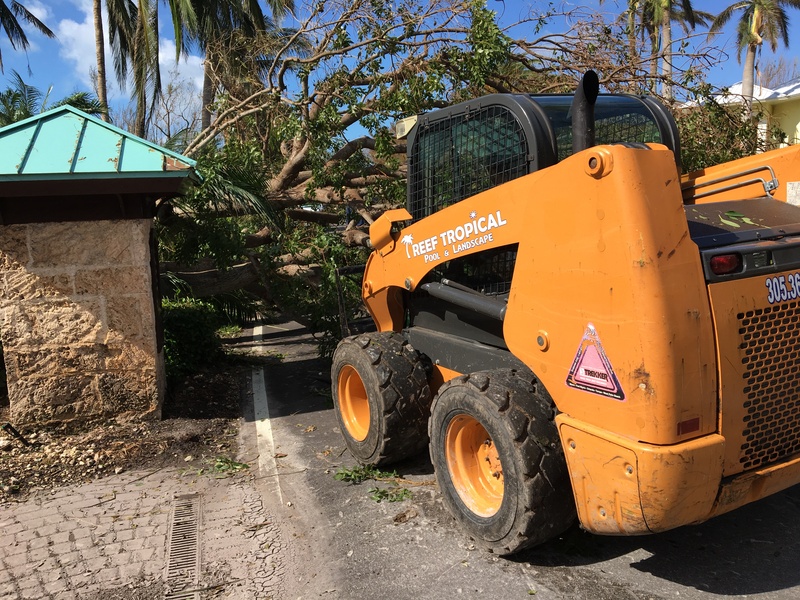 Reef Tropical is on properties throughout South Florida and The Keys now, working to help clients recover from Hurricane Irma’s destruction. At Reef Tropical, we know our postcard views and tropical weather can come at a cost. 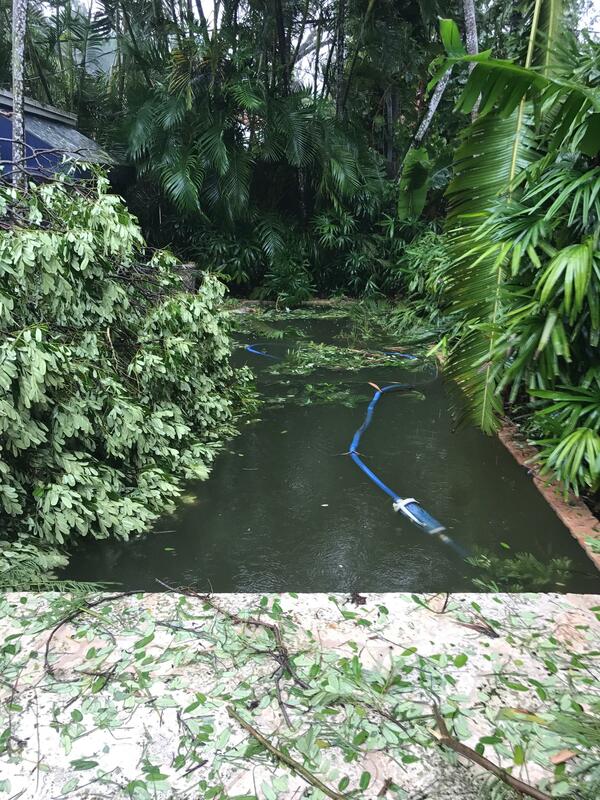 That’s why we partner with clients to make sure they protect their pools and landscapes during hurricane and tropical storm season. We want to put you in the best position to weather any storm. If the eye of the storm is aimed at The Keys and flood waters rage, our team is a first-responder, out in the field assessing damage to clients’ properties, clearing roads and driveways for access, enacting immediate clean-up efforts and providing the support, staff and expertise so you can rest assured that the storm clean-up job is getting done right. 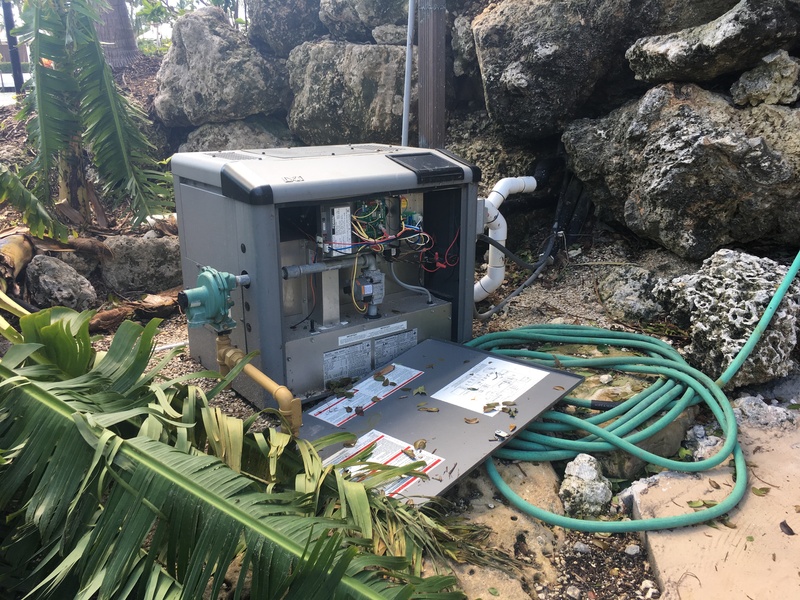 There’s a lot to consider when cleaning up after a hurricane or tropical storm—and especially one as volatile as Irma, which caused widespread power outages, down trees and resulted in low water pressure throughout the South Florida region. What does South Florida and The Keys look like now, after Irma? The landscape here now is littered with fallen live trees—uprooted ficus, palms and specimen trees that were once the pride and joy of properties. Live wires and trees are still blocking some roads, and bridge damage is making storm recovery efforts a challenge. We got hit hard. But there is good news: You’re not alone in this cleanup effort, and whether you’re a resident, property manager, realtor or property owner managing a grounds maintenance staff, you need and have our support. We partner closely with our clients to ensure a thorough clean-up and to restore landscapes and pools as soon as possible. We're currently hard at work removing all trees that may be compromising a roof, leaning on a home or blocking a driveway. 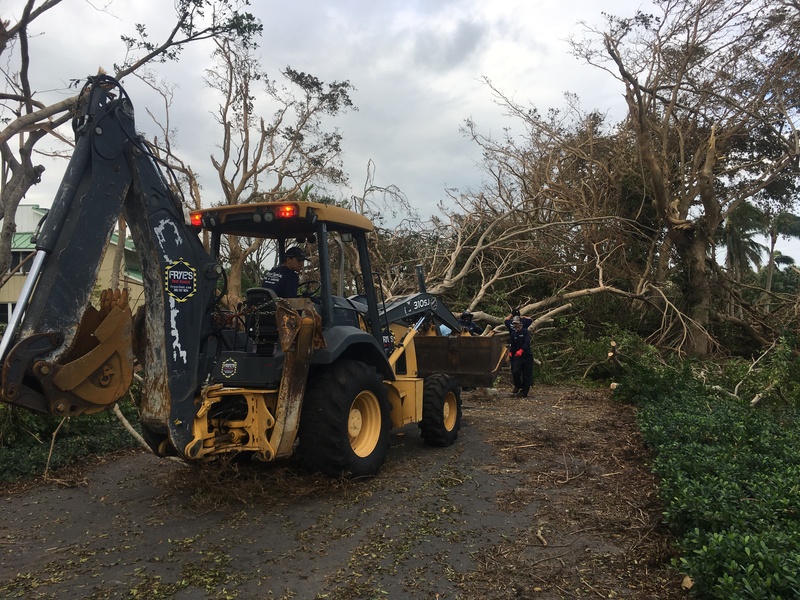 We are focused on quick urgent tasks with crews using certified chainsaw operators, bucket trucks, heavy equipment and chippers. We are attempting to prop up expensive palms when possible with priority access to heavy equipment. The longer the wait, amount of root exposure and salt water damage all play into the chances of saving the tree. Most trees will not recover even after they are propped up. We'll be coming back through a second time to do a heavier cleaning and gather debris for pile up and removal - with fine tuning following in coming weeks if you are a maintenance customer. Here’s what to look for in a disaster clean-up contractor to minimize risk, protect the safety of people on your Florida property, and ensure immediate and effective response. Does the contractor have the ability to respond immediately to your storm clean-up needs? Is there a team on the ground, working around the clock to remove dangerous debris and address your urgent needs? 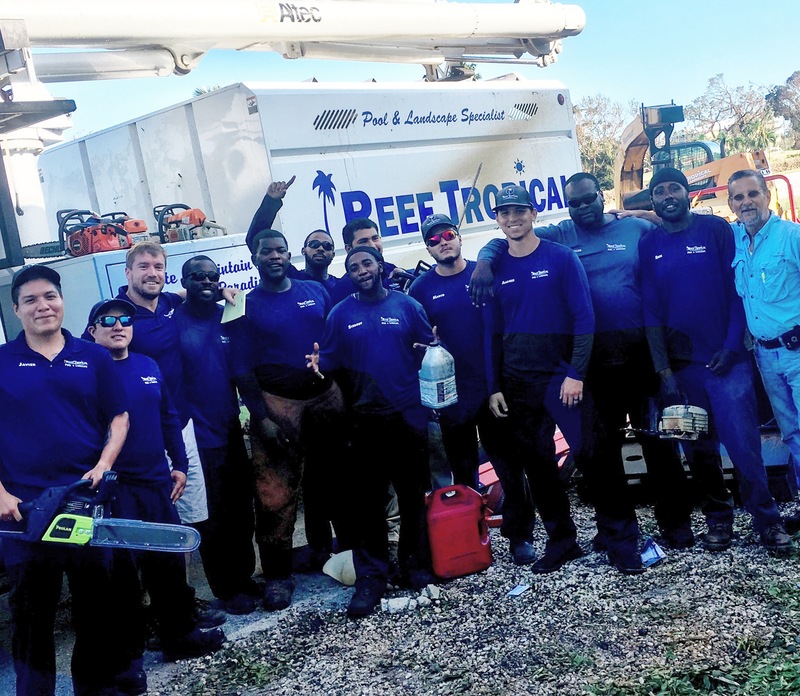 At Reef Tropical, we have a dedicated disaster response team that is focused on the safety of our crews and our clients. We’re concerned about your personal well being and the state of your property. Because we have such long-term relationships with our clients, we have really gotten to know them and their properties over the years. When a storm hits, we’re out there checking on their sites, addressing damage and creating a plan for clean-up and restoration. We are doing everything we can to make sure your pool will be back in working order as soon as possible. Currently, we're ensuring we can access the equipment, making sure the equipment is off, removing debris and shocking pools with chemicals. We've been turning all equipment off so that nothing shorts once the power comes back on or so that the pumps don't burn out. If the pool is trashed, we have to assess whether pool can be restored using chemical treatment and debris removal or whether it has to be drained, acid washed and refilled with chemical startup. Once the power is back, we'll be doing in depth equipment inspections to ensure all systems are operational (so that we can get the pool circulating as soon as possible). Getting proper circulation through the filtration system is key for the pool to turn blue and clear again. It will happen in a matter of days with some filter cleanings. Be sure the company you hire is properly insured. Hurricane cleanup can be dangerous work, and you do not want to take on the liability of hiring a contractor that is not protected. A professional contractor like Reef Tropical will minimize risks during clean-up and work with you to remove all debris. Because we are a full-service landscape maintenance and pool contractor, we don’t just clean up the mess—we rebuild what was destroyed to restore your property. Some sites weathered significant damage from Irma, and after clean-up they will require new planting, landscape renovations and structural repairs to pools. Other properties were hit so hard that after clean-up, they’ll be starting with a blank canvas. Partner with a landscape and pool contractor that can walk you through this process, from clean-up to design and installation. We understand the emotional stress and business tragedy that serious storms cause clients—and we want to help. Please call us. 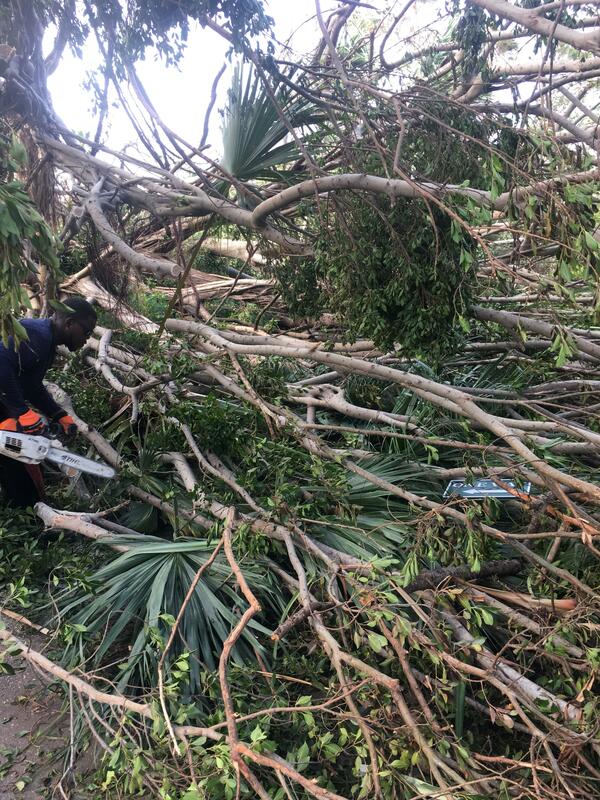 We’re focused on making sure the residents and businesses of South Florida and The Keys are safe, and our disaster response crew is experienced with tropical storm and hurricane clean-up. We have the licensing, experience and man-power to respond efficiently and ensure a safe, thorough clean-up. Contact us at 305-367-2005, or fill out this simple form and we’ll get in touch with you. We want to be a resource for you. Please do not call 911 for non-emergencies. If you need help, here are some important numbers to have on hand. Sign up for Miami-Dade Emergency Alerts here.